I recently came across a site “League of Legends, Sri Lanka”. 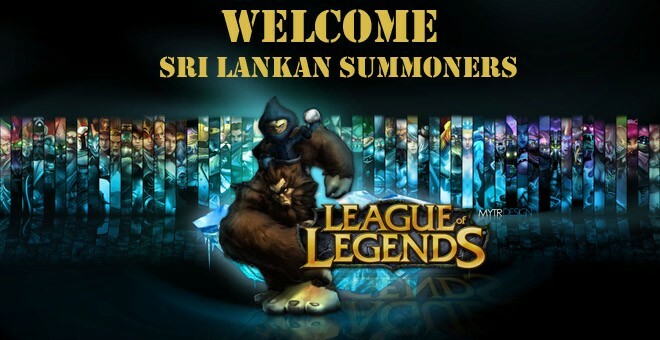 I did know that there is a small League of Legends community in Sri Lanka but I did not know that, there is even a web site(sllol.com) for it. It is so interesting and delightful to know that somebody (there was no place to find out admins of that site) is trying to build a lol community for real in Sri Lanka. I’ve been playing league of legends on EW and NA servers. But none of the places you specified are active to set up teams etc. I will be playing lot in EUW (agnilam), (still early levels) not much in NA (IamAgnilam), only “first win of the day”. If you need to find people there is a LOL fan page for sri lanka in facebook, there are lot of good players. hey guys any one hav any idea hw to fix this massive lag in league.. i m using NA server… since may first it has a bad lag..i cant do anything to fix it..any idea? Seems like you are from Sri Lanka! If you are having lag in NA in past few days, I don’t think you have any issue on your side. Just wait till its fixed. I think problem is with the NA server itself (95% sure :D). If you take NA it has high ping. In OCE community is not mature like old servers. EUW da OCE da sl walata hodama ?